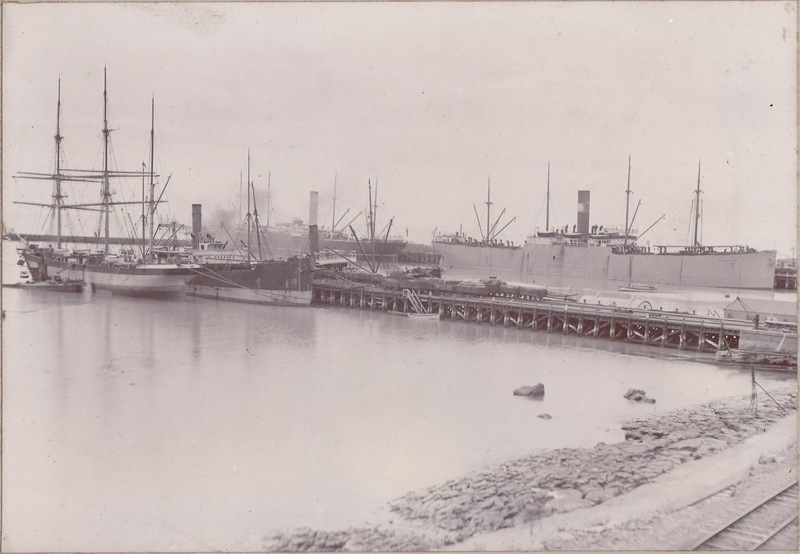 The Everton Grange, a fine new steamer built last year for Messrs Houlder Bros. and Co., of London, arrived in Dunedin from New York and northern New Zealand ports on Monday last, and in Timaru on Saturday morning, in the course of her first voyage to this colony. The steamer, besides having a huge cargo capacity, has space for 150,000 carcasses of frozen mutton. Captain Brown, late of the Langton Grange, is in command, and reports that the new steamer has acquitted herself very creditably during her long voyage especially during the time when extremely rough weather was encountered. About 800 miles off Cape Leeuwin four large icebergs were passed. They were observed from the steamer at a distance of about three miles in broad daylight. The largest iceberg was estimated to be about 250 ft in height, and from three quarters of a mile to a mile in length. The dimensions of the steamer are: Length over all 490 ft, beam extreme 56ft, depth moulded 35ft 6in, deadweight carrying capacity 11,000 tons. Although the vessel is built to Lloyd's highest class, the scantlings in many instances far exceeded that society's requirements. The Everton Grange is built of Siemens-Martin steel throughout, on the deep frame principle, with cellular double bottom, all fore and aft, for water ballast, and a remarkable feature in the construction of the vessel is the number of specially long shell plates fitted admidships, which are over 66ft long, and weigh almost six tons each, being backed up by frames 15in. deep. The hull of the Everton Grange is divided into nine compartments by means of eight water tight bulkheads, fitted in accordance with Board of Trade requirements. She has six large cargo hatches and eleven powerful steam winches, with a special arrangement of derricks for the rapid handling of cargo, the vessel being able to discharge cattle and cargo and do her bunkering at the same time without one operation interfering with the other. The whole of the cargo holds are controlled by steam fire appliances. The vessel has two complete steel decks, and in addition a steel shade deck above, with a bridge 125ft long on top of some. Arrangements are made for carrying 750 head of cattle under the shade and bridge decks, the holds and 'tween decks being insulated for the carriage of frozen meat. The vessel is lighted throughout by electricity. The captain, officers, engineers, and petty officers are berthed in deckhouses on the bridge deck, the seamen and firemen in shelter deck aft, and the cattlemen in shelter deck forward. The vessel is rigged as a four-masted fore and aft schooner. The twin-screw triple-expansion engines, of massive design, fitted by. Messrs Richardson, Westgrath, and Co., Limited, Hartlepool, ran exceedingly well throughout the official trial, a speed of over twelve knots being attained. The sizes of cylinders are 23in, 36in, 59in, by 42in stroke, with five boilers; 15ft 9in by 11ft, working at a pressure of 1801b per square inch. Messrs D. C. Turnull I and Co are. the Timaru agents for' the vessel. She will load here about 11.000 sacks of grain for London, and will be despatched to-day or to-morrow for an Australian port, where she will complete her loading for South Africa and London. An excellent souvenir of the interesting scene in the Barrack-square on Saturday last, on the occasion of the presentation of the Victoria Cross to Major Heaphy, was exhibited at this office yesterday, in the shape of a large-size well-executed photographic view. The picture is well calculated to perpetuate the event in every household, and will doubtless be much sought after by those who feel an interest in the occasion. The view is taken from the Barrack offices, and comprehends the entire square, at the time the presentation was made by the General Commanding. 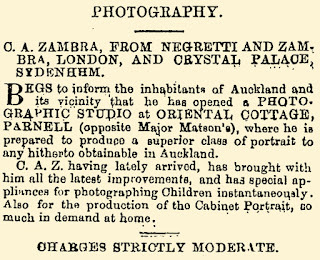 The view is in the best style of photography, having been taken with lenses imported from the well-known establishment of Negretti and Zambra, of London, by Mr. Zambra, photographic artist, of Parnell. Mr. Zambra, for a long time well known to fame as a photographer of high order, has re-commenced business in that line of art. 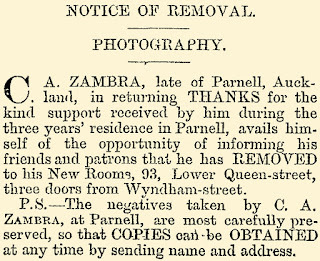 He has taken the premises in Shortland Crescent at one time occupied by Mr. Redfern. An accident occurred at an early hour yesterday morning to Mr. Zambra, a photographer, which we regret to say has terminated fatally. About half-past five o'clock in the morning the crew of the ketch Fanny Thornton were aroused by hearing a heavy body fall on the deck of the vessel, and on coming up they found Mr. Zambra lying on the deck insensible, and bleeding profusely from the head. He bled from the nose, ears, and mouth. 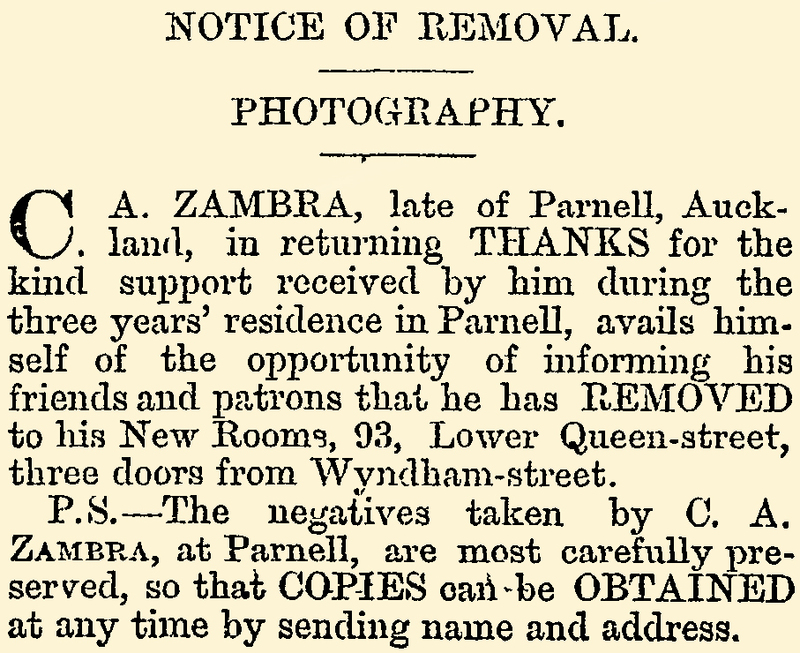 Word was at once sent to the police, and Constable Rist had Mr. Zambra conveyed in a cab to the Hospital, where he was at once attended to by the house-surgeon, but from the first no hopes were entertained of his recovery. He lay in a comatose state all day, and expired at 8 o'clock yesterday evening. The accident was not observed by any person, but it is supposed that Mr. Zambra walked too close to the edge of the wharf, and that his foot must have tripped against the guard-stringer of the wharf, and caused him to tumble over on to the vessel. The fall was about 13 feet, as the tide was low at the time. He was perfectly sober when the accident occurred, and appeared to be following his usual habit of taking an early walk. An inquest will be held to-day. The inquest on the unfortunate man, Zambra, who died from injuries received by falling off the Queen-street Wharf on to the deck of a vessel, did not take place on Saturday, as anticipated, owing to Dr. Gildsbro' having to visit Kohimarama Naval Training School. It will take place to-day, at the usual hour, 2 p.m., at the Provincial Hospital. The Late Accident on the Queen-street Wharf. A coroner's inquest was held yesterday afternoon, at the Provincial Hospital, before Dr. C. F. Goldsbro' and a jury (of whom Mr. D. S. Chambers was elected foreman), on the body of Cæsar Anthony Zambra, photographer, who came by his death from injuries received by falling over the Queen street Wharf on to the deck of the ketch Fanny Thornton, on the 25th instant. The jury, having examined the body, the following evidence was adduced. 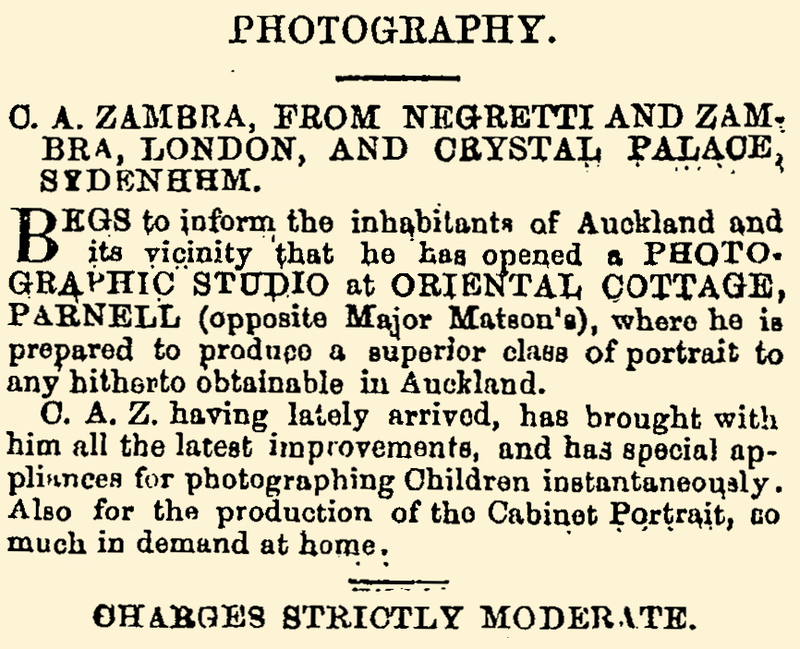 Dr. Philson deposed that the deceased was about forty-five years of age, and a photographer by occupation. Deceased, when brought to the hospital, was in a state of insensibility, and bleeding profusely from both ears. There were no external grounds, but there was an extensive contusion above his eyes. No smell of drink was observed about him. It was evident he had suffered mortal injury of the brain and he died the same evening at 7.30 o'clock. The cause of death was injury of the brain resulting from a fall on the crown of the head, producing extensive fracture. No money or property was found on deceased. 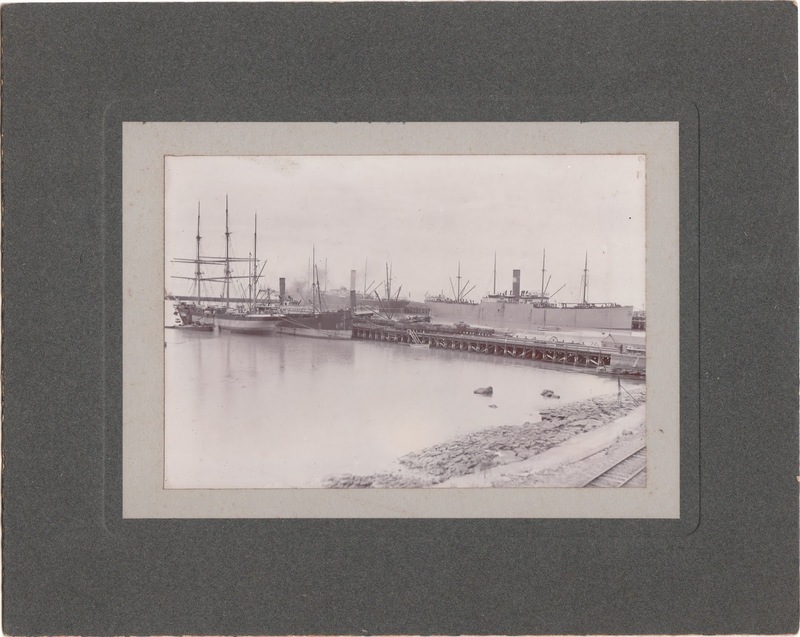 Charles Johnston deposed that he was a seaman, serving on board the schooner Jessie. He was on Queen-street wharf at daylight on Friday, the 25th instant. Was walking up the wharf, when a young woman walking before him looked down on the deck of a vessel lying alongside, and said some one had fallen down, and then she walked away. Witness went for a policeman. Saw no scuffle, or any one near the vessel. The young woman walked up the wharf ahead of witness, having come off one of the steamers. Witness assisted the police to get the man from the deck of the vessel on to the wharf. He was then groaning. By a Juror: There was no person on deck but the deceased. Constable Rist deposed that he found the deceased lying on the deck amidships, having a quantity of clotted blood about him. One of the crew was holding him in a sitting position and bathing this head. Deceased never spoke. He went for an express, to take, deceased to the hospital, which was done shortly afterwards, arriving there at 7 a.m. He never spoke, but opened his eyes once. The blood on the deck was congealed, but little was on his clothes. Blood oozed from his ears. His hat was lying on the deck. Identified the body, viewed by the jury, as that of the deceased, Cæsar Anthony Zambra. Witness went on duty that morning at 5 o'clock. His beat was in Queen-street, terminating at the Thames Hotel. Believed that the man was fatally injured : when he saw him. By a Juror: Did not know deceased intimately. Could not tell whether he was short-sighted. There were no planks from the wharf to the vessel's deck, or protruding from the side of the wharf. Frederick Augustus Yates deposed that he was a seaman on board the ketch Fanny Thornton, lying alongside the Queen-street Wharf. On the morning of the 25th instant, about 5.45, was aroused by a noise on deck. Called the other men of the crew, and found that they also had been awakened by the noise. Put on some clothes, but before he was dressed one of the seamen named Aicken, went up, and saying, "Some poor fellow has fallen down on our deck." Witness went on deck, and found the deceased lying there in a quantity of blood, which was, coagulated. Raised him to a sitting position, and got another of the crew named Robinson to bathe his face. Assisted to get him into the express which had been obtained by the police, who had previously arrived, and they took him to the hospital.Witness believed that the noise, which woke him was that of the man falling on the deck. The blood on deck was of a dark frothy character. It was very easy for anyone not looking carefully to trip against the side of the wharf and go over. The ceased had one hand in his pocket when found on the deck; he had never had time to remove it. The room having been cleared, the jury, after a few minutes' deliberation, brought in a verdict of "Accidental death through fracture of the skull."